Welcome back to the Queen Kapiolani Hotel, a Waikiki landmark and your home away from home. Enjoy a brand new experience with property wide enhancements through the $35 million renovation. 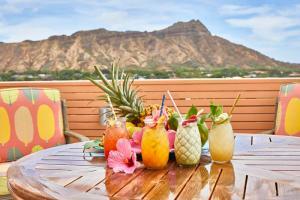 Relish in a beautiful island getaway with the most comfortable guest accommodations and the best views in Waikiki. Directly overlooking Queen Kapiolani Park and the best surf break in Waikiki, Queen Kapiolani rests on lands once reserved for Hawaiian royalty. With its unique location you can walk through the 300-acre Kapiolani Park to reach Diamond Head’s summit, ride a bike to Kahala, or turn right and dive into Honolulu’s surf, shopping, and nightlife. Located between Cartwright Road and Lemon Road, facing Kapahulu Avenue. A three minute walk to Waikiki Beach and within walking distance of the Honolulu Zoo, Waikiki Aquarium and the 108 acre Kapi'olani Park. Eco Tours, Sailing, Scuba Diving, Parasailing, U.S.S Arizona Memorial & Pearl Harbor, Historical Iolani Palace, Chinatown, Waikiki Aquarium, Ala Moana Shopping Center, Kodak Hula Show, Polynesian Cultural Center.